It always amazes me how many incredible companies we have right here in Nashville. As someone who was born and raised in this wonderful city, I always love to support and promote the local companies that make it so unique. That's why I was excited when Visit Music City asked me to curate a stocking in Music City Marketplace. 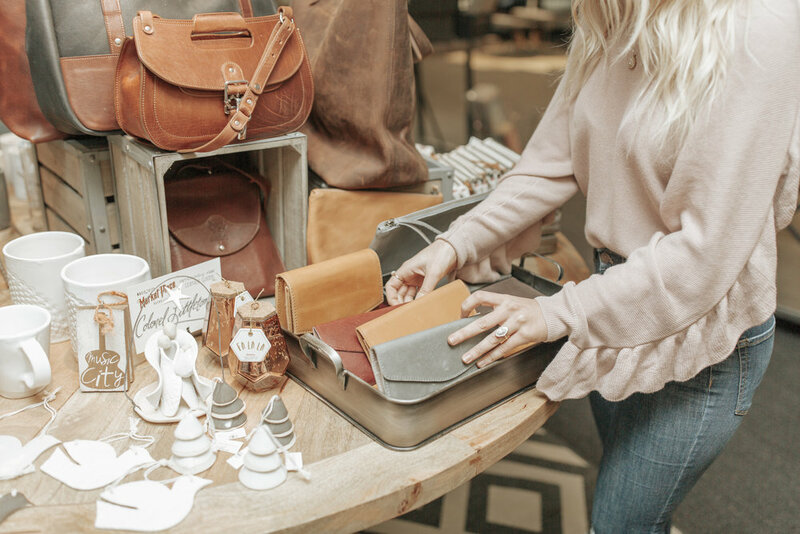 The Music City Marketplace offers a curated selection of gifts, home goods, and accessories for an authentic take on the creative culture that defines Nashville. 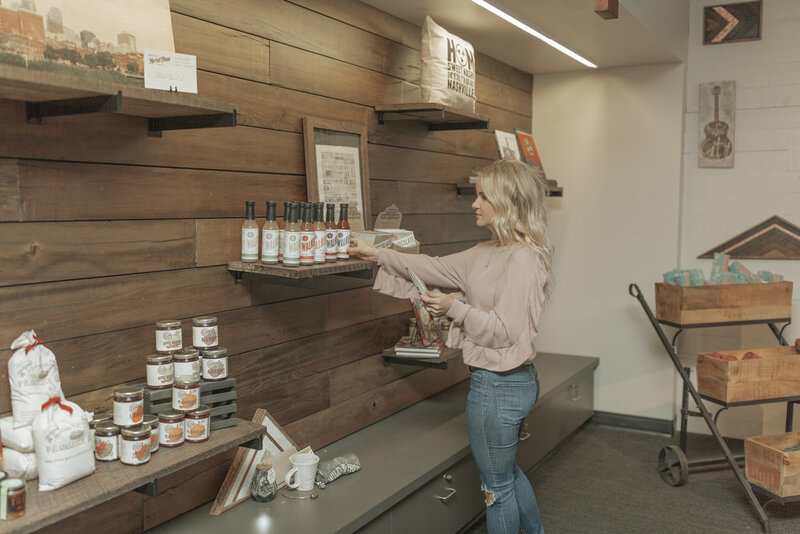 Whether you're a local or someone passing through, it is an awesome place to check out the latest and greatest products by some of most innovative Nashville artisans. Through 3/31/2018, you can use code HUNTER10 for 10% off (in store and online). 1767 Designs Shelby Wall Hanging in Dawn - I am OBSESSED with this local company. I have one of their designs hanging in my kitchen and I'd love to add another one to my living room soon. 1767 creates reclaimed wood furniture handmade in Nashville, TN. 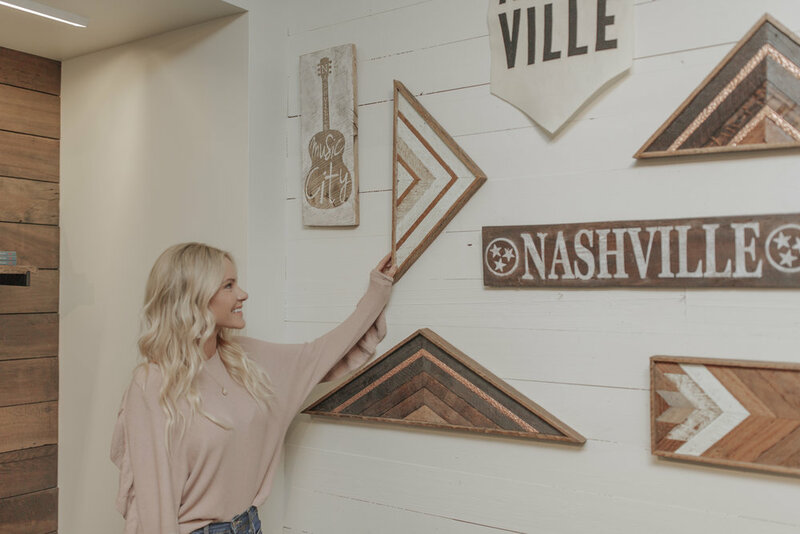 The wood is reclaimed from old houses and buildings around town, which makes for an awesome way to incorporate a bit of Nashville history in your own home. ABLE Debre Wallet in Fog - I absolutely adore this company and what they stand for. Their focus is on ending generational poverty by working with women who have often overcome extraordinary circumstances. A few of my favorite staple bags are from there and I can't get enough of their jewelry. Plus, you can always feel good about your purchases because you're helping women in need find their purpose. Seraphine Design Origin Collar in Double Pyrite - I have been eyeing this collar for months, and I was so excited to see Seraphine Design in Music City Marketplace! 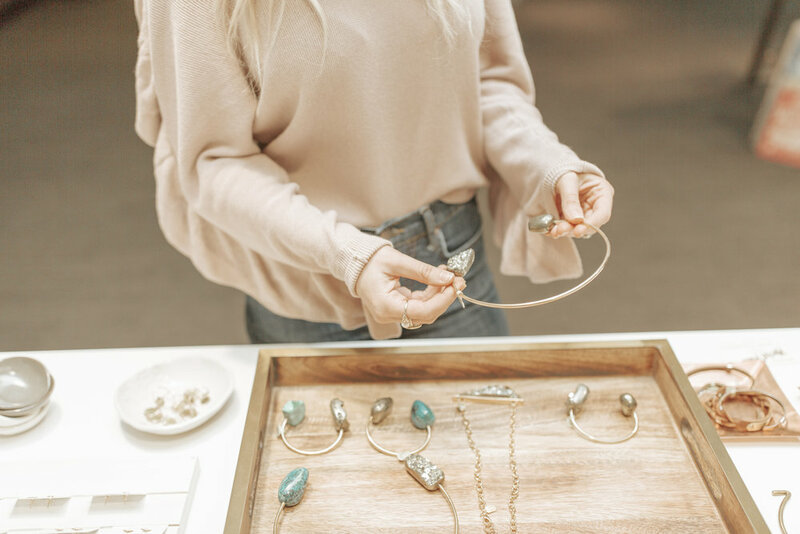 Local designer Brooke Seraphine has an eye for harnessing raw, natural beauty. Her designs are sure to be a hit with the fashionista on your Christmas list. Paddywax Mercury Prism Holiday Candle in Merry Everything - Paddywax's holidays scents are my favorite way to bring the warmth and coziness of the season into every room of my house. I'm especially obsessed with the Balsam + Fir scent — I'll be burning that candle every day until Christmas! In addition to their amazing fragrances, they come in the cutest vessels. The company's inexpensive yet adorably giftable candles make them one of my favorite local candle companies, and I burn their signature scents in my home all year long! Handmade Studio TN Handbuilt Mug - I'm a sucker for great pottery, and everything designer Morgan Williamson touches is gold. Handmade Studio TN creates modern and functional ceramics for the table and home. I'm such a fan of their attention to detail and unique designs. Their canisters, dishes and serving ware would be a great gift for parents or in-laws. Olive & Sinclair 67% Cacao Chocolate Bar - This girl LOVES some dark chocolate, and one of my favorite chocolate companies just happens to be right here in my own backyard. Slow-roasted and stone ground in small batches, you can't miss the smooth and robust flavor unique to Southern Artisan Chocolate. They're located on historic Fatherland Street and they offer factory tours Tuesday-Saturday. Their holiday gift sets make the perfect hostess gifts and are sure to be a hit with everyone on your list! Straw Castle Designs Wild & Free Tee - I had never heard of this company before visiting Music City Marketplace, but I was immediately drawn to their vintage-inspired screen prints and t-shirts. I bought a Wild & Free shirt for myself, and they had so many great guys shirts as well. These aren't your average tourist prints and tees, ladies and gents! Shop my whole stocking here and check out Music City Marketplace's Instagram for more local goods here. I was lucky enough to be a part of this with some other awesome local bloggers and friends. Make sure you check out their sites!